For the Portuguese infante, see Infante António of Portugal. For other people named Antonio I, see Antonio I (disambiguation). António, Prior of Crato (Portuguese pronunciation: [ɐ̃ˈtɔniu]; 1531 – 26 August 1595; sometimes called The Determined, The Fighter or The Independentist), was a grandson of King Manuel I of Portugal and claimant of the Portuguese throne during the 1580 dynastic crisis. According to some historians, he was King of Portugal as António I of Portugal for 33 days in 1580. After the crowning of Philip II of Spain as King of Portugal, António claimed the throne until 1583. He was a disciple of Bartholomew of Braga. António was born in Lisbon, the illegitimate son of Prince Louis, Duke of Beja (1506–1555) and Violante Gomes (some sources argue that his parents were later married, perhaps at Évora). His mother may have been of Sephardic Jewish extraction, as many Portuguese sources maintain, or possibly of "new Christian" (a forced convert of Jewish or Muslim origin) extraction. At least one source says she was a member of the minor Portuguese nobility, the daughter of Pedro Gomes from Évora. She died a nun at Santarém on 16 July 1568. António was educated in Coimbra, and he was placed in the Order of St. John. He received the wealthy priory of Crato as a benefice. In 1571, he was named governor of the Portuguese fortification at Tangiers in Morocco. Nonetheless, little is known of his life until 1578. In that year, he accompanied King Sebastian of Portugal (1557–1578) in his invasion of Morocco, and he was taken prisoner by the Moors at the Battle of Alcácer Quibir, the same battle where the young king was slain. António is said to have secured his release on easy terms by concocting a fiction. He was asked the meaning of the cross of St. John that he wore on his doublet, and he replied that it was the sign of a small benefice which he held from the Pope, something he would lose if he were not back in Portugal by 1 January 1579. His captor, believing him to be a poor man, allowed his release upon payment of a small ransom. While António was a prisoner in Morocco, his uncle Henry, the cardinal archbishop of Évora and only surviving brother of King John III of Portugal (1521–1557), was proclaimed the new monarch. The cardinal was old and the last legitimate male representative of the royal line. In January 1580, when the Portuguese Cortes were assembled in Almeirim (where the rightful heir of the Portuguese throne was decided), old Cardinal-King Henry died without having designated a successor. The regency of the kingdom was assumed by a governing junta composed of five members. 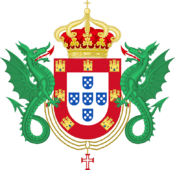 By this time, the Portuguese throne was contested by several claimants. Among these were Catherine, Duchess of Braganza; King Philip II of Spain; and António, the Prior of Crato. All three had problems: Catherine was a woman, Antonio was illegitimate, and Philip was a foreigner. Catherine was adjudged to have been the legitimate heir posthumously, after her descendants obtained the throne in 1640 (through King John IV of Portugal). However, in 1580, she was but one of several possible heirs. According to the feudal custom of primogeniture, the oldest living son of the king was to be proclaimed the legitimate successor. Since the line of King John III, son of King Manuel I, was extinguished on the death of King Sebastião in Morocco, Manuel's next son, Prince Luis, was the legitimate heir. Since he had died, his son, António, should have become the new king. Although his birth was illegitimate, precedent had been set in 1385 with the proclamation of John, son of Pedro I, as king. John I was also of illegitimate birth. But António's enemies seized on his illegitimacy to put forward their own candidates. António, relying upon popular hostility to a Spanish ruler (even if Philip's mother was Portuguese), presented himself as an alternative candidate to King Philip II. He endeavoured to prove that his father and mother were married after his birth, but no evidence of the marriage could be found (and whether such a marriage ever took place is still debated). António's claim was not supported by the nobles or gentry because many of them had been bribed, promised future benefits, or threatened with the loss of their privileges and estates. Most of António's partisans were drawn instead from the lower clergy, the peasantry, and artisans. Philip ensured the success of his claim to the Portuguese crown by using gold from the Americas to bribe the upper classes of Portugal; these aristocrats and rich believed that a personal union of the Spanish and Portuguese crowns would be highly profitable for Portugal (whose economy was then failing), which would maintain formal independence as well as autonomous administration in both Europe and its empire. António tried to win the common people to his cause, cashing in the diffuse anti-Spanish Portuguese identity and comparing the current situation to the one of the 1383-1385 Crisis. Then, just as in 1580, Philip II invoked arguments of blood nature to inherit the Portuguese throne; and like in 1580, the Master of Aviz (John), illegitimate son of King Peter I of Portugal, claimed his rights to the throne that ended in victory in the Battle of Aljubarrota and in the Cortes of Coimbra in 1385. On 19 July 1580, António was proclaimed King of Portugal in Santarém which was followed by popular acclamation in several locations of the country. However, he governed in Continental Portugal for only 20 days, culminating in his defeat in the Battle of Alcântara by the Spanish Habsburg armies led by Fernando Álvarez de Toledo, Duke of Alba on 25 August. After the above event, he attempted to rule Portugal from the island of Terceira, in the archipelago of the Azores, where he established an opposition government that lasted until 1583, and where he even minted coin — a typical act of sovereignty and royalty. His rule was recognized only in the Azores where his supporters, such as Ciprião de Figueiredo and Violante de Canto, were able to organize a resistance. Meanwhile, on the continent and in the Madeira Islands, power was exercised by Philip II, who was recognized as official king the following year by the Portuguese Cortes of Tomar. In early 1581, he fled to France carrying with him the Portuguese Crown Jewels, including many valuable diamonds. He was well received by Catherine de' Medici, who pretended to have a claim to the Crown of Portugal. She looked upon him as a convenient instrument to be used against Philip II. By promising to cede the Portuguese colony of Brazil to her and the sale of some of his jewels, António secured support to fit out a fleet manned by Portuguese exiles and French and English adventurers. 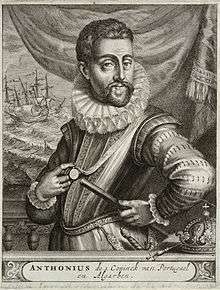 As the Habsburgs had not yet occupied the Azores, he sailed for them with a number of French adventurers under Philip Strozzi, a Florentine exile in the service of France, but was utterly defeated at sea by the Álvaro de Bazán, 1st Marquis of Santa Cruz at the Battle of Ponta Delgada, off the coast of the island of São Miguel between 25–26 July 1582. He then returned to France and lived for a time in Rueil near Paris: fear of assassins, employed by Philip II, drove António from one refuge to another until he finally went to England. Queen Elizabeth I of England favoured him for much the same reasons as Catherine de' Medici did. In 1589, the year after the Spanish Armada, he accompanied an English expedition, under the command of Francis Drake and John Norreys, to the coast of Spain and Portugal. The force consisted partly of the queen's ships, and partly of privateers who joined in search of booty. António, with all the credulity of an exile, believed that his presence would provoke a general rising against Philip II. However, none took place and the expedition was a costly failure. António soon fell into poverty. His remaining diamonds were disposed of by degrees. The last and finest was acquired by Nicholas Harlai, Seigneur de Sancy, from whom it was purchased by Maximilien de Béthune, duc de Sully. It was later included among the jewels of the crown of France. During his last days, António lived as a private gentleman on a small pension given by King Henry IV of France. He died in Paris on 26 August 1595, and was buried in the middle of the choir of the convent church of the Franciscan Observantists (Cordeliers). The church was demolished in 1811. He left six illegitimate sons by two different women. In addition to papers which he published to defend his claims, António was the author of the Panegyrus Alphonsi Lusitanorum Regis (Coimbra 1550), and of a cento of the Psalms, Psalmi Confessionales (Paris 1592), which was translated into English under the title of The Royal Penitent by Francis Chamberleyn (London 1659), and into German as Heilige Betrachtungen (Marburg, 1677). António continued to fight for the restoration of an independent royal dynasty of his country until the end of his life. He did not see the end of the Philippine dynasty's Iberian Union, in 1640, when a Portuguese — the grandson of his cousin, the Duchess of Braganza — was acclaimed king as John IV of Portugal, after a victorious coup on 1 December 1640. António, being a cleric, was never permitted to marry but had illegitimate children with several women. Manuel de Portugal 1568 22 June 1638 Accompanied his father in the exile in France, England and Flanders. Married Emilia of Nassau, daughter of William the Silent. Cristóvão de Portugal April 1573 3 June 1638 After his father's death continued to fight for his cause. Dinis de Portugal ? ? Cistercian monk. João de Portugal ? ? Died young. Filipa de Portugal ? ? Nun at the Monastery of Lorvão. Luísa de Portugal ? ? Nun in Tordesillas. ↑ Copy of the engraving at the National Maritime Museum, Greenwich). ↑ Ester Kosovski (1995). Etica Na Comunicacao. Mauad Editora Ltda. p. 102. ISBN 978-85-85756-12-3. Retrieved 25 June 2013. ↑ Eurípedes Simões de Paula (1970). Revista de história. s.n. p. 22. Retrieved 25 June 2013. ↑ A. Rosenthal (1964). Judaica & Hebraica: From the Libraries of the Late Chief Rabbi Dr. Hermann Adler, Dayan.... Rosenthal. p. 68. Retrieved 25 June 2013. ↑ José de Castro (1942). O Prior do Crato. Tip. União gráfica. p. 17. Retrieved 25 June 2013. ↑ Camilo Castelo Branco (1879). Dom Antonio, prior do Crato. E. Chardon. p. 92. Retrieved 25 June 2013. ↑ Genea – Portuguese Genealogical site – Violante Gomes, a "Pelicana"
1 2 3 4 5 Hannay 1911. ↑ Ogier Ghislain de Busbecq (9 August 2012). The Life and Letters of Ogier Ghiselin de Busbecq: Seigneur of Bousbecque, Knight, Imperial Ambassador. Cambridge University Press. p. 161. ISBN 978-1-108-05456-0. Retrieved 24 June 2013. ↑ Maximilien de Béthune Sully (1778). Memoirs of Maximilian de Bethune, duke of Sully, prime minister to Henry the Great: Containing the history of the life and reign of that monarch, and his own administration under him. J. Rivington and sons. p. 201. Retrieved 24 June 2013. António is frequently mentioned in French, English, and Spanish state papers of the time. A life of him, attributed to Gomes Vasconcellos de Figueiredo, was published in a French translation by Mme de Sainctonge in Amsterdam (1696). A modern account of him, Un prétendant portugais au XVI siècle, by M. Fournier (Paris, 1852), is based on authentic sources. See also Dom Antonio Prior de Crato-notas de bibliographia, by J. de Araújo (Lisbon, 1897). This article incorporates text from a publication now in the public domain: Hannay, David McDowall (1911). "Antonio, Prior of Crato". In Chisholm, Hugh. Encyclopædia Britannica. 2 (11th ed.). Cambridge University Press.